(VEN) - After the seven years of implementation, the biotechnology development and applications in processing industry until 2020 project has gained many important research achievements, contributing to lifting the position of the country’s processing industry. The biotechnology development and applications in processing industry until 2020 project was approved by the prime minister in 2007 and presided by the Ministry of Industry and Trade. The aim of the project was to research modern biotechnology for applications into reality such as microorganism, enzyme and protein technologies. The state then encourages enterprises to promote technological receipts and transfers to achieve a sustainable development for the processing industry. So far, project has gained many important research results which have been successfully applied in reality. For example, the project “Researching and producing some functional foodstuff made from soybeans” has worked out six technology processes to produce soybean finished products rich in isoflavone, gaba and amine acid to create some functional foodstuff that prevent heart disease. At present, this technology has been transferred to the International Foodstuff Development Joint Stock Company. It was expected that in 2013 and 2014, the company would produce 10,000 kilograms of functional foodstuff which was assessed to be of high competitiveness compared with the imports from Japan and India. The project “Researching the technology on producing food for eels made from enzyme and some available materials in Vietnam” has produced five tonnes in the form of powder and pills with same quality but 15-20 percent cheaper than the imports. The research result was received by Van Xuan Aquaculture Co, Ltd to produce eel feed at a capacity of 1,000 tonnes per year and an estimated profit of VND5 billion a year. The project “Denatured starch test production by enzyme to make materials for foodstuff and pharmaceutical industry” has completed two technology processes including a denatured starch production process by enzyme from cassava and another similar process from rice. The research results have been applied at Minh Duong Foodstuff JSC at a capacity of three tonnes of denatured starch a day to make food adjuncts for supply to the domestic market. The project set a target that biotechnology in processing industry will contribute 20-25 percent of total contribution of science and technology to the added value of the processing industry by 2015 and over 40 percent by 2020. In addition, there are other economically-efficient projects like the project “Experiment production of surimi and its products” which completed six technology processes: producing surimi from anabas at a scale of 20 tonnes a day, producing surimi from dory at 20 tonnes a day, producing mixed surimi from freshwater and saltwater fish at five tonnes a day, producing shrimp surimi at one tonne a day, producing cuttle surimi at one tonne a day and producing surimi from seafood products at one tonne a day. The project “Experiment production of functional milk for people on a diet” resulted in technology processes to produce Forlac Sure for the elderly and Forlac Forcerna for diabetics at 100 tonnes a year at only 50-60 percent of the prices of the imports. 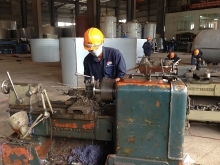 The achievements obtained from the project “Biotechnology development and applications in processing industry until 2020” contributed to raising the value of industrial products, creating products with high competitive advantages compared with the imports, adding jobs for laborers and proving positive changes in professionalism of Vietnam’s processing industry./.